The Royal College of Organists has unveiled a 2019 events programme packed with courses and classes aimed at organists and choral directors of all ages and levels of attainment. The Royal College of Organists is delighted to announce the appointment of Sir Andrew Parmley as its new Director. To simplify and improve the process for signing in to RCO websites, we have introduced a new unified log-in system. The Royal College of Organists has announced the results of its Spring and Summer 2018 accreditation sessions. The Royal College of Organists has announced details of its autumn classes programme. The Royal College of Organists has launched a new mentoring scheme designed to give College Members access to informal and confidential support with career-related matters from fellow professionals. Royal College of Organists Director Philip Meaden has announced his intention to retire in 2018. Six semi-finalists have been announced in the IAO/RCO Organ Playing Competition 2018. An organ recital in memory of former RCO vice-president Peter Williams will be performed at St George’s Church, Hanover Square, London on Thursday 24th May. The Royal College of Organists has announced the results of its Winter 2018 examination session. Members of the Royal College of Organists are invited to register for an online Meet the President event. The Royal College of Organists is to recognise the achievements of four distinguished musicians by awarding them its highest honour, the RCO Medal. The Incorporated Association of Organists and the Royal College of Organists have launched a new competition for organists. The College's AGM and Conferment of Diplomas will both take place at Southwark Cathedral, London SE1, on Saturday 10th March 2018. The RCO is delighted to be collaborating with The Queen's College, Oxford on an organ recital in honour of James Dalton. The Royal College of Organists has appointed Stephen Farr as its new Chief Examiner. The results of the ISM-RCO survey of organists’ fees are now available online. The Royal College of Organists has announced the results of its Summer 2017 examination session. The Royal College of Organists will mark the 100th birthday of Dr Francis Jackson CBE with a special event on 4th October 2017. The winners have been announced in the composition competition organised by The Orgelbüchlein Project and RCO. The Royal College of Organists (RCO) has announced its autumn programme of courses, classes and events, including three major city events. Martin Baker, Master of Music at Westminster Cathedral, begins his term of office as President of the Royal College of Organists (RCO) on 1st July 2017. The RCO has refreshed its email publications for College members and other subscribers. For a number of years the College has been fortunate to work with the administrations of each of the Three Choirs Festivals: Gloucester, Hereford, and Worcester. Ten composers have been shortlisted in the composition competition run by The Orgelbüchlein Project and the RCO. The Orgelbüchlein Project and the RCO have teamed up to run an Orgelbüchlein composition competition, to be judged in a public concert. The Royal College of Organists has appointed Tom Bell as its Director for the North of England, North Wales and the Isle of Man. It is with great sadness that the College learnt recently of the death of James Dalton. Three outstanding recitalists will be performing in Cambridge during this year’s RCO Easter Course. The Royal College of Organists has recognised the achievements of two distinguished musicians and scholars by awarding them its highest honour, the RCO Medal. The Royal College of Organists has been awarded a £2,500 gift by The Patron’s Fund. Vol. 10 of the Royal College of Organists’ annual research publication, RCO Journal, has been published. The College's AGM and Conferment of Diplomas will both take place at Southwark Cathedral, London SE1, on Saturday 11th March 2017. The Royal College of Events has announced two 2017 events designed to support teenage organists looking to pursue their organ playing through higher education. The RCO has launched a new early-level certificate scheme for organists. The RCO begins its 2017 events programme in January with a celebration of all things light. Martin Baker, Master of Music at Westminster Cathedral, has been announced as the next President of the Royal College of Organists (RCO). The Royal College of Organists has announced a new regional structure designed to increase local activities and engagement across the United Kingdom. The Royal College of Organists has announced the results of its Summer 2016 examination session. The Royal College of Organists is seeking to expand its teaching and accreditation activities across the UK, so as better to serve the needs of those who play the organ and direct choirs. RCO Academy has announced a busy autumn programme of courses and classes, with Scotland a focus for three major events at the end of October. Bishop of Leeds the Rt Rev Marcus Stock launched the new Diocese of Leeds Organ School with a service at Leeds Cathedral on 17th May 2016. It is with great sadness that we have to report that Prof. Peter Williams HonFRCO, a Vice President of the College, has passed away after a short illness. The Royal College of Organists has launched iRCO, an innovative virtual campus designed to provide easy access to learning, research and general information for organists and choral directors. The RCO received more than 900 responses to its 2015 survey, providing a unique insight into the musical life of organists and choral directors. The College's AGM and Conferment of Diplomas will both take place at Southwark Cathedral on Saturday 12th March 2016. The Royal College of Organists is to recognise the achievements of three distinguished musicians and scholars by awarding them its highest honour, the RCO Medal. The 2015 edition of the Royal College of Organists’ annual research publication, RCO Journal, has been published. David Pipe has been appointed as Director of the Diocese of Leeds Organ School and Organist of Leeds Cathedral from May 2016. The Royal College of Organists is urging all organists and choral directors to make sure that their voice is heard in its 2015 survey. The Diocese of Leeds in partnership with The Royal College of Organists wishes to appoint a Director of the Organ School and Cathedral Organist. It is with great sadness that we learnt today of the death of Sir David Willcocks at the age of 95. The Royal College of Organists has announced the results of its Summer 2015 examinations. It was with profound sadness that the College learnt today of the death of Dr John Scott FRCO. Organist, composer and conductor Dr Philip Moore begins his term as President of the Royal College of Organists (RCO) on 1 July 2015. The Royal College of Organists has announced the results of its Winter 2015 examinations. The Royal College of Organists has announced details of its two flagship summer events, offering inspirational teaching, outstanding instruments and unique social experiences for any organist. The College's AGM and Conferment of Diplomas will both take place at Southwark Cathedral on Saturday 14th March 2015. The Royal College of Organists (RCO) is proud to feature some of the world’s finest teachers and performers in its 2015 spring programme of courses, classes and other events. The Royal College of Organists (RCO) is pleased to confirm the appointment of two new Trustees. 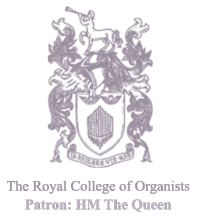 The 2014 edition of the Royal College of Organists’ annual research publication, RCO Journal, has been published. The Royal College of Organists has announced the results of its Summer 2014 examinations. The Royal College of Organists is pleased to announce the appointment of Philip Meaden as its new Chief Executive. The South Bank Centre is offering RCO Members a 10% discount for the Organ Symposium at the Royal Festival Hall on Saturday 2 August. It was with great sadness that we learned of the passing of Barry Lyndon, a long-standing servant of the Royal College of Organists. The Royal College of Organists has announced an autumn events programme featuring learning opportunities for organists of all ages alongside further celebration of the College’s 150th anniversary. The Royal College of Organists marked its 150th anniversary with a full day of events at Southwark Cathedral on Saturday 8th March. The Royal College of Organists has announced the results of its Winter 2014 examinations. The Royal College of Organists has confirmed details of a Spring Festival of courses and a special conference as part of its 150th anniversary programme. The Royal College of Organists is to recognise the achievements of two of Britain's most distinguished musicians by awarding them its highest honour, the RCO Medal. The College's AGM and Conferment of Diplomas will both take place at Southwark Cathedral on Saturday 8th March 2014. Would all Members and other website visitors please be aware that the College’s website at www.rco.org.uk will be unavailable for a period of up to 24 hours from 14:00 on Friday 22 November. The Royal College of Organists has launched a major new fundraising campaign to coincide with its 150th anniversary celebrations. The Royal College of Organists has announced the results of its 2013 summer examinations. A new ‘jobs board’ service for organists has been launched by the Royal College of Organists. The 2013 edition of the Royal College of Organists’ annual research publication, RCO Journal, has been published. The Royal College of Organists has announced a programme of events to celebrate its 150th anniversary in 2014. Catherine Ennis, Director of Music at the City of London church of St. Lawrence Jewry, has begun her term as President Elect of the Royal College of Organists (RCO). The Royal College of Organists (RCO) has announced an international recital challenge as part of its forthcoming 150th anniversary celebrations. The Royal College of Organists (RCO) is pleased to confirm the appointment of three new Trustees. The Royal College of Organists has announced the results of its 2013 winter examinations. The College's AGM and Conferment of Diplomas will both take place at Southwark Cathedral on Saturday 9th March 2013. We have been greatly saddened to learn of the death of our colleague and College Vice President Sir Philip Ledger. The Royal College of Organists (RCO) is proud to feature some of Britain’s finest teachers and performers in its 2013 season of courses, classes and other events. The Annual Festival of New Organ music takes place in London on Saturday 20 and Sunday 21 October this year, supported by the Royal College of Organists. Three RCO Student Members have won the prizes in the senior category of the 2nd Northern Ireland International Organ Competition, whilst a fourth was highly commended. The Royal College of Organists has announced the results of its 2012 summer examinations. The Royal College of Organists (RCO) has announced a UK-wide autumn events programme packed full of repertoire, technique and performance. The 2012 edition of the Royal College of Organists’ annual research publication, RCO Journal, has been published. We were greatly saddened to learn of the death of our colleague and College Vice President John Birch. The Royal College of Organists will take on the responsibility for the day-to-day management of the National Pipe Organ Register (NPOR) from 1st July. The Royal College of Organists has announced the results of its 2012 winter examinations. The College's AGM and Conferment of Diplomas will both take place at Southwark Cathedral on Saturday 10th March 2012. The Royal College of Organists (RCO) has announced a strong mix of courses, classes and other events for the first half of 2012. The Royal College of Organists has announced the results of its 2011 summer examinations. The Royal College of Organists (RCO) has announced an autumn events programme with a strong focus on nurturing the next generation of young musicians. The Royal College of Organists (RCO) has been awarded Â£18,000 by The Ouseley Trust to support the RCO Academy education programme. The Royal College of Organists has conferred awards on 49 members at its annual Conferment Ceremony. The Royal College of Organists is holding two major events during summer 2011. The Royal College of Organists has announced the results of its 2011 winter examinations. The Royal College of Organists has announced the appointment of Mark Brafield as a Trustee. The College's AGM and Conferment of Diplomas will both take place at Southwark Cathedral on Saturday 12th March 2011. An auction at Sothebyâ€™s on December 1st is set to feature seven manuscript items from the Collegeâ€™s Library. The Royal College of Organists has announced for 2011 its largest and most wide-ranging events programme ever. The Royal College of Organists and St Giles International Organ School have announced a new partnership for 2010. The Royal College of Organists has announced the results of its 2010 summer examinations. James Oâ€™Donnell, Organist and Master of the Choristers of Westminster Abbey, has begun his term as President Elect of the Royal College of Organists (RCO). Four Student Members of the College, all of whom recently gainded their Associateship (ARCO) Diploma, will perform lunchtime recitals in the Three Choirs Festival in Gloucester this August. An exciting new event promises to make 1st, 2nd and 3rd of October 2010 days to remember for anyone with a love of singing. Please note that the RCO website www.rco.org.uk will be down for essential maintenance between the evening of Monday 17th May and the following morning, Tuesday 18th May. Photographs are now available from two successful College events in March - the Conferment of Diplomas at Southwark Cathedral and Sing! Messiah at the Royal Hospital Chapel in Chelsea. The Royal College of Organists has conferred awards on 35 members at its annual Conferment Ceremony. The Royal College of Organists has announced the results of its 2010 winter examinations. The Royal College of Organists has announced the appointment of Noel Flannery as a Trustee. The Royal College of Organists has announced the appointment of Gavin Barrett as a Trustee. The Royal College of Organists has announced the launch of RCO Academy, marking a major expansion of its education and outreach work. Anyone interested in the College's January 2010 CertRCO, FRCO or ARCO examinations is reminded that the deadline for applications is Friday 16th October 2009. The Royal College of Organists has announced the results of its 2009 summer examinations. Next week (August 3rd to 8th) sees a unique event in the organ calendar taking place across the City of London. The Royal College of Organists is seeking to appoint two trustees to strengthen the business skills of its Trustee Council. Four young organists have been selected by the Royal College of Organists to feature in recitals at this year’s Three Choirs Festival. The College is delighted to have taken on the promotion of the highly respected and successful London Organ Forum, artistic directors Ann Elise Smoot and William Whitehead. A short film telling the story behind the award-winning Dan and the Magic Musician animation is now available to watch on the internet. The Royal College of Organists has announced the results of its elections to Council. The College's AGM and Conferment of Diplomas will both take place at Southwark Cathedral on Saturday 14 March 2009. Dan and the Magic Musician has won a prestigious BBC Connect and Create Award. Some of the greatest composers, the best-loved venues and today's most influential musicians feature in the RCO's spring and summer events programme for 2009. Worcester Cathedral’s new four-manual 53-stop Quire organ will be the centre of attention for 250 children in March as part of a massive educational event, Organ-ise. We were greatly saddened to hear of the death of our colleague and College Vice President Richard Hickox. Members are entitled to receive 10% off the price of tickets for evening organ concerts at Symphony Hall (SH) and Town Hall (TH), Birmingham in the current season. David Sanger has taken up the Presidency of the Royal College of Organists. Anyone interested in the College's January 2009 CertRCO, FRCO or ARCO examinations is reminded that the deadline for applications is 17 October 2008. A unique animated film aimed at introducing young people to the pipe organ has been unveiled by the Royal College of Organists. Over the past few days, we have been aware of a few short periods during which the College website, www.rco.org.uk, has been unavailable. College members are being advised to book early for this year's London Organ Forum, which is focused on the Mulliner Book and the birth of English organ music. This year’s RCO St Giles Summer Course for Organists is set to be the most successful ever. Five young organists have been selected by the Royal College of Organists to feature in recitals at this year’s Worcester Three Choirs Festival. Musicians young and old will be gathering in Birmingham for events throughout April and May to celebrate choral and organ music. The Royal College of Organists has conferred awards on 33 members at its annual Conferment Ceremony. Three public organ recitals will be taking place during the College's residential course running from 3 - 5 April. Members and Non-members alike are very welcome to attend and to bring guests. The Royal College of Organists is once again offering a scholarship for one student choral conductor to attend the Charles Wood Summer School in Armagh, Northn Ireland. The Royal College of Organists' Annual General Meeting and Conferment of Diplomas will take place at Southwark Cathedral on Saturday 8th March. The Royal College of Organists (RCO) has announced its most comprehensive Cambridge residential course yet. The Royal College of Organists has published its latest Directory of Members for 2006-2007. The Royal College of Organists has announced a major revision to its Certificate (CertRCO) examination, with an increased emphasis on practical skills and the organist's role in religious worship. Dr Geoffrey Webber's extensive commentary on the current editions of Buxtehude's organ music has been published online for RCO members. The RCO has announced a series of interim arrangements to handle examination applications, subscription payments and event bookings during the Royal Mail strike. Nearly 200 schoolchildren and 30 adults from across Upminster were with the RCO at St Laurence’s Church in October to find out more about the pipe organ. Opportunities for choral directors and young organists feature alongside a visit to one of England’s finest cathedrals in the Royal College of Organists’ autumn programme of events. Dr Stephen Cleobury has been appointed President Elect of the Royal College of Organists (RCO). This is a complete archive of RCO news release. Click here to return to the main News & Media Centre page.